As promised in my post earlier today, here is a post about the scarf which I made for PDMC for his birthday. 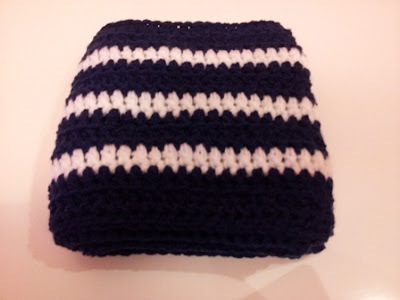 It's made in navy blue and white DK yarn from my stash. I began by chaining 200 stitches.I've started using a stitch marker when I make my foundation chain, because I tend to lose count and do lots more than I actually need. On this foundation chain I used it when I'd got to 100 stitches. 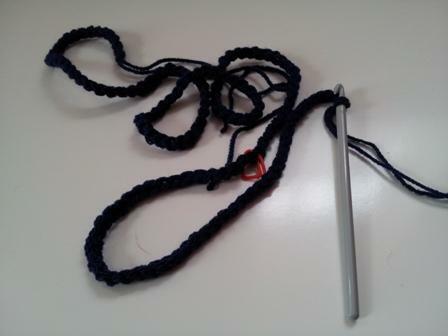 Then I worked a treble crochet into each chain. I used two strands of my DK yarn together as I wanted a chunkier fabric. 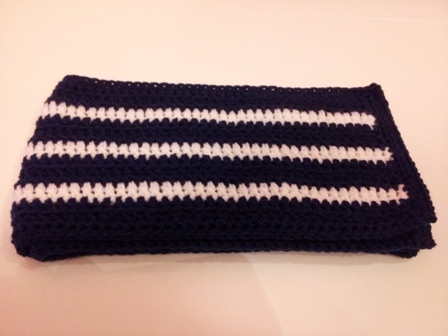 I also wanted this to be in blue and white because they are the colours of PDMC's favourite football team, Tottenham Hotspur. 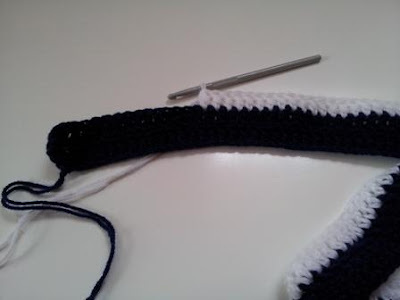 I did two rows of treble in blue and then switched to white. 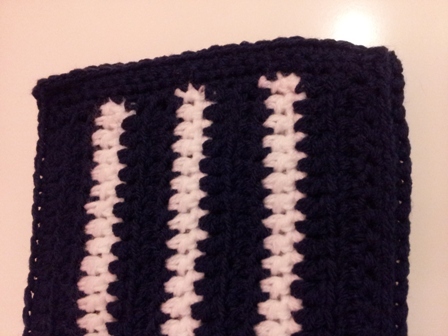 I worked the one row of white into the back loops only and then I then changed to blue again, working in the front loops only for the first row and into both loops for the second row. This gives a slightly flattter fabric than working into both loops and makes the pattern that the colours create look a lot more even. It worked up really quickly and I was quite happy with the result. 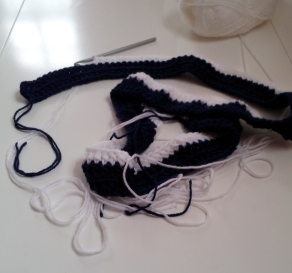 I worked a row of double crochet around the whole of the scarf which finished it off quite nicely. 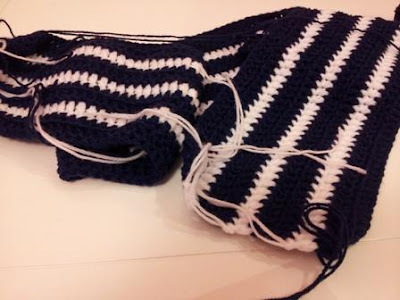 The finished scarf measures about 7" x 60" and is very thick and warm. PDMC really loved his scarf and he asked for a matching pair of gloves and a hat with a bobble on the top too.